Crippling depression is fun stuff. Makes you value the important things for what they actually are. Why haven't I had the time and energy to make a piece for this weekly. I mean... Gods and godesses is one of my main interests. zombieMode: I think the "messy look" you are referring to is called "texture". This might be the best one I've seen from you. Very nice. I'm a sucker for this kind of details. Very good use of the palette. Looks good! I like the shape and shading on the skull. But, the color count is a little high. There are some colors that are nearly identical. 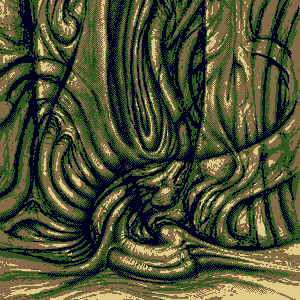 I fiddled with it a bit in GrafX2 and could reduce the palette from 31 to 21 colors in a couple of minutes. I could probably optimize it down to 17-18 with little to no loss in quality. Really good weekly! I had a hard time voting. Shortlisted for the Most epic dump of the year Award! I can't even begin to fathom the amount of work that must have gone in to this. I fucked up last weekly.. Started to make a piece but "overslept". I didn't know itt was yours when I voted for it. But yeah... solid pixels, as always. I might make something for this challenge. Dawnbringer: Holy crap! I'm really looking forward to the updated ToolBox. Awesome! GrafX2 is dead easy to set up. Just download, extract and you're good to go. I guess the interface and tools can be a bit unusual if you don't have any prior experiences with Deluxe Paint or Pro Motion or similar, but if you spend a few minutes with the help file and figuring out the intertface it shouldn't be a huge problem. cure: beer, gin and rotten carcass is my favorite flavours. It's a great shame that I didn't manage to finish my piece for the weekly. Psychiatric care got in the way. I've got a pretty comfy bed tho. If I manage to find a mouse in this place I might finish it. It would be a somewhat proper thing to do, considering the theme. I just might do something for this weekly challenge. I too, have erased that line.